Preciosa Ornela presents further inspiration for making your own creations using beads from the Preciosa Traditional Czech Beads brand, but this time in fashionable neon colors which are a definite fashion hit for 2013. 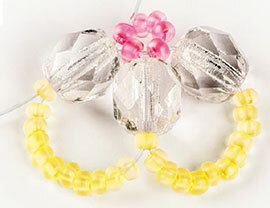 The beads and seed beads from the Preciosa Traditional Czech Beads brand in neon colors are available in transparent versions made from crystal glass and in opaque variants. 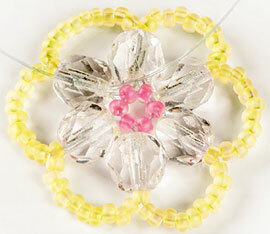 Also try the excellent effect of the bright colors and make a small or large ring using the detailed tutorial. 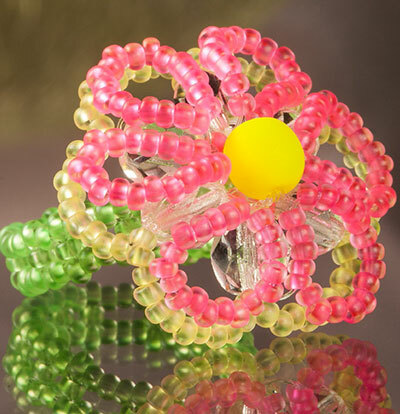 The motif of the seed bead flower can also be used as inspiration for other creations. This could involve excellent earrings and there certainly should not be any problem with using this motif to make a necklace, hair decorations, clips or brooches. So let us inspired by bright neon colors! We wish you much colorful inspiration when working with our beads and seed beads. String 6x R11 onto the line (160cm), move them to the center of the line and thread the line through the first R11 one more time. This will give rise to the basic circle (figure no. 1). Now string FPB5 for the smaller ring size or FPB6 for the larger flower. 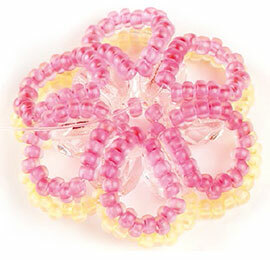 We will always hereafter state the number of seed beads for the smaller and the larger rings. String 1x FPB, 12/18x R11 and 1x FPB and then thread the line through the second R11 from the basic circle. Pass the second end of the line through the second FPB and the penultimate R11 according to the tutorial and tighten appropriately. Then string 11/17x R11 and 1x FPB. Repeat this procedure 5x (figure no. 2a). This will form the basic flower and both ends of the line will then be threaded through the first FPB in opposite directions (figure no. 2b). String 4/5x R11 and thread the second end of the line through these seed beads in the opposite direction and tighten appropriately (figure no. 3a). 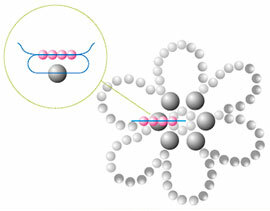 String 11/15x R11 and create the arch of the petal. Add another 4/5x R11, pass both ends of the line through them in opposite directions and fix the stringing by threading both ends of the line through the nearest FPB. Repeat the entire procedure 6x. This will give rise to the second layer of petals (figure no. 3b). 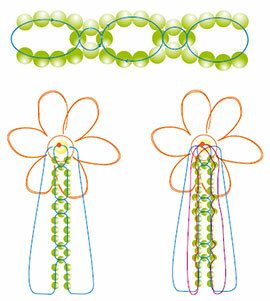 Extend both ends of the line to the center of the flower. One of them must therefore be thread through the seed bead from the nearest petal one more time. Then string 1x PB onto both ends and thread both ends through the seed bead from the basic circle on the other side of the seed bead flower. String the strap which will serve as the ring band according to the drawing (figure no. 4). Then thread both ends of the line through the seed beads from the initial circle one more time, tighten appropriately and tie off the ends with a double knot. Thread the ends of the line into the holes of the nearest seed beads and cut it off. The ring is finished!